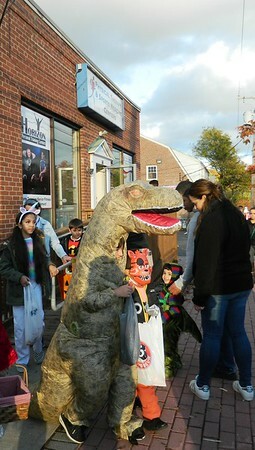 NEWINGTON - A unicorn and a dinosaur would normally be a remarkable sight downtown, but not this week. But the two marched up and down the sidewalks of Market Square Monday evening along with all the usual suspects: witches, angels … super heroes. 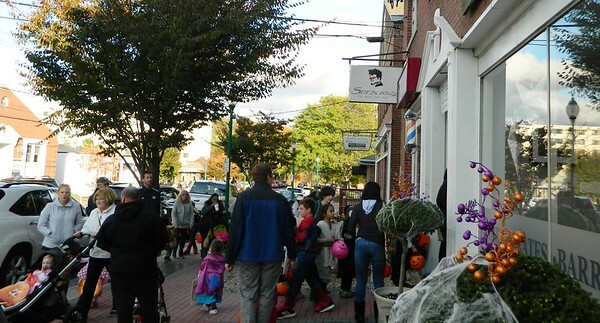 Newington businesses pulled together a beloved Halloween event that fell by the wayside after the Downtown Business Association dissolved a few years ago. 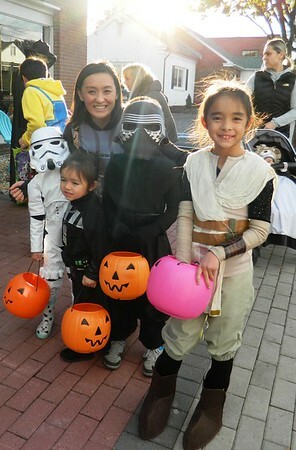 They called it “A Trick-or-Treat Stroll,” though there was more running, jumping and spinning than strolling. “I’m glad they started doing this again,” Jaclyn Gatto said with Superman and Wonder Woman by her side. 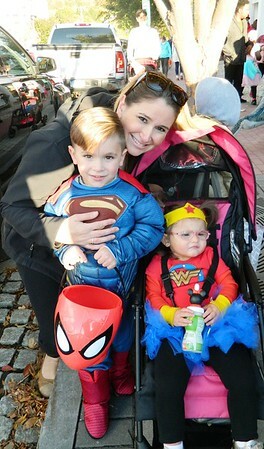 Her son Liam, 4, and daughter Ella, one-and-a-half, were dressed as those DC comic book legends. Gatto grew up in Newington, but the family came from their home in Wethersfield to participate Monday. They weren’t the only out-of-towners. A few families from New Britain and Meriden also joined residents. 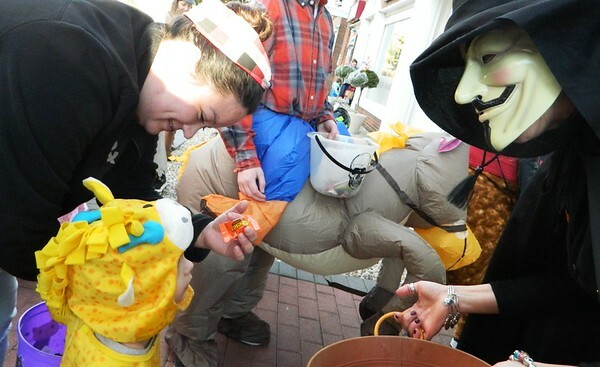 More than 30 shops, restaurants and other businesses opened their doors to trick-or-treaters, complimenting their costumes and placing candy into their totes. “Since we don’t have the business association anymore the businesses themselves stepped up and wanted to do something,” explained Susan Valente, owner of Core Barre Studio at 85 Market Square. Those participating posted orange fliers in their windows, so families would know where to stop in their trek downtown. It was easy to tell, however, since hundreds turned out, squeezing by one another as they entered and exited doorways. Traffic persisted downtown Monday evening as drivers stopped to allow groups of kids to cross the road. “The families feel very safe,” pointed out Kim Sabottke, a stylist at Strand Hair Salon. 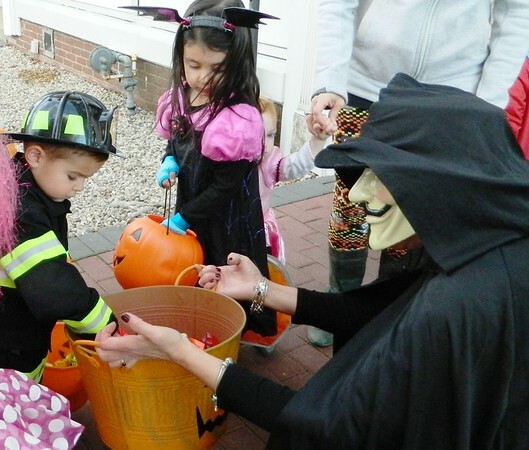 She crouched on the sidewalk in front of the salon with a giant bowl of treats, dressed as ‘V’ - the antihero from ‘V for Vendetta.’ Kids of all ages had no qualms about walking right up to her, despite the brooding mask. 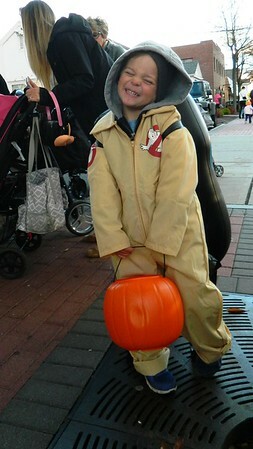 A few costumed parents included Carey Brunetti, mother of McKenzie, 7, Evelyn, 4, Callen, 6, and Isabelle, 3. “We’ve always had a love for Star Wars,” she said, a Storm Trooper by her side. Each member of the family was dressed as a different character from the epic space saga. Michelle and K.C. 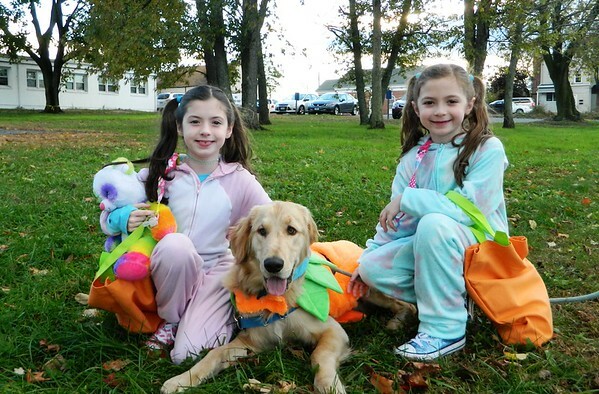 Klett held the leash on their 8-month-old golden retriever Brody as their daughters Madison, 9, and Avery, 7, walked through Constitution Square to begin hunting down candy. “We’ve been trick-or-treating here since they were little,” the girls’ father said. 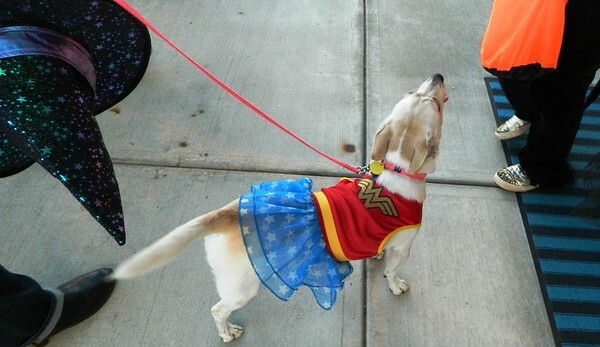 Employees handing out sweets at each business enjoyed seeing all of the kids dressed as their favorite characters. Market Square Dental’s candy distribution took place inside its lobby. That way, staff could all greet youngsters. Posted in Newington Town Crier, Newington News on Thursday, 1 November 2018 08:09. Updated: Thursday, 1 November 2018 08:11.